Today's news that the U.S. military operation in Kandahar will take longer than expected lands amid the American public's least friendly outlook on the war in Afghanistan since 2007, according to the latest Washington Post-ABC News poll. Overall, 53 percent say the war is not worth its costs, a new high in Post-ABC polling. That includes 41 percent who feel that way strongly, matching the previous high in August 2009. The public divides nearly evenly on how things are going there, with 42 percent saying the U.S. is winning and 39 percent losing; 12 percent say neither side has an edge. Views on the war are similar to those in an April Post-ABC poll, but support lags far behind its level in December following President Obama's announcement of a new strategy for the conflict. Republicans, who are the strongest backers of the war, continue to shift against it, with the overall share supportive of the war dipping from 69 percent in April to 62 percent now and the percentage strongly supportive dropping below 40 percent for the first time. Among Democrats, two-thirds consider the war not worth its costs, as do 53 percent of independents. Republicans are most optimistic about the current state of affairs in Afghanistan, with six in 10 saying the U.S. is winning the war there. Independents are about evenly split (40 percent say winning, 41 percent losing) and nearly half of Democrats (48 percent) say the U.S. is losing compared with a third (33 percent) who think America is winning. Those who feel the U.S. is prevailing in the conflict are far more apt to say the war has been worth its costs (72 percent compared with 17 percent among those who feel the U.S. is losing and 36 percent who call it a draw), yet even among this group, just over a quarter say it has not been worth fighting. Q. All in all, considering the costs to the United States versus the benefits to the United States, do you think the war in Afghanistan has been worth fighting, or not? Do you feel that way strongly or somewhat? Q. All told, do you think the United States is winning or losing the war in Afghanistan? Next: Will Obama group get Southern hospitality from Gulf voters? The current situation in Afghanistan simply confirms what was well known in 2001, that the Taliban was the Afghan government, and that Osama Bin Laden was there as an honored guest. The question President Bush should have asked was how many polaris missiles will it take to elliminate this pestilence? If Obama would have kept his campaign promises we would not be in Afghanistan or Iraq at this time all the troops would be home guarding the border between Mexico and the United States. Q- Why is the American army in Afghanistan ? A- Because terrorists are being trained there to launch attacks in the US . Q- Why do they want to lauch attacks in the US ? A- Because the American army is in Afghanistan . i assume the previous post is somekind of joke. or maybe they really think 9/11 was a response to american invasion of afghanistan and not vice-versa. Bush’s blunders are haunting US Afghan mission. First, during the siege of Kunduz in November 2001, the Bush administration allowed Pakistan to spirit away by airlift hundreds, if not thousands, of Taliban operatives cornered by the advancing Northern Alliance in Kunduz. Pakistan relocated those Taliban cadres including Mullah Mohammed Omar in Quetta, the provincial capital of Baluchistan from where Mullah Omar’s QST has been planning raids in Afghanistan ever since. ‘Quetta Shura Taliban (QST) based in Quetta, the provincial capital of Baluchistan, is the No. 1 threat to US/NATO mission in Afghanistan. At the operational level, the Quetta Shura conducts a formal campaign review each winter, after which Mullah Mohammed Omar (Afghan Taliban Chief) announces his guidance and intent for the coming year‘ as General McChrystal narrated in his August, 2009 report to President Obama. But US can not even use its drones to destroy QST that is causing daily deaths of US/NATO soldiers in Afghanistan since 2002! Second, Bush administration did NOT provide sufficient troops to secure Afghanistan against Taliban because so many US troops were tied down in Iraq to destroy Saddam‘s imaginary weapons of mass destruction. Third, Bush put blind faith in Musharraf’s Pakistan to fight the very terrorist threat that Pakistan itself created. Musharraf continued to shelter, protect and support Mullah Mohammed Omar’s Quetta Shura Taliban in Quetta, provincial capital of Baluchistan and Haqqani network in North Waziristan. Bush naively tolerated such a duplicitous Musharraf game. of all the insane wars. The Insane War in Iraq - no al-Qaeda there, just a civil war - bring the troops home last year. The Insane War in Afghnaistan - no al-Qaeda there, just a civil war - bring the troops home now. The Insane War on Drugs (Marijuana) - just props up gangs and criminals worldwide, just like Prohibition did - legalize it and move on - it's on the General election ballot this November in all the Western states, so it doesn't matter what you whiskey-drinking druggies back East think, that war is going to end. The only good war we're fighting is the black ops war against al-Qaeda - who are in Pakistan, Yemen, Saudi Arabia (where they get all their Wahhabi fanatic texts, all the funding for terrorist-creating Madrassas worldwide, and 95 percent of the money and volunteers worldwide), and Somalia. As long as Pakistan is not brought in line or DIVIDED in 4 parts, terror foot solders and their supplies would continued to be poured by double-speaking Pakistani army/ISI using US dollars. HM: Do whatever you want to with the containers, burn them or rob them, I have nothing to do with it. But ask him what relationship he has with Mansoor Ijaz and William Casey? William Casey was the chief of CIA." It is clear that NATO supplies are being destroyed or looted at the instruction of some elements of ISI/army of Pakistan to supply Afghanistan Taliban and weaken NATO forces. This is nothing but a sheer blackmail of NATO and USA by Pakistan establishment made up of ISI/army. "The question President Bush should have asked was how many polaris missiles will it take to eliminate this pestilence?" No wonder the world fears and haters the USA. That is like surgery with a hand grenade. Good people live in Afghanistan. They are our allies. We have made promises and we can well afford to keep them. But who is for honor these days? We will find out soon enough. But we have a President we can count on. "If Obama would have kept his campaign promises we would not be in Afghanistan or Iraq ..."
Please forgive me, but anyone who paid attention during the campaign would blush at this remark. The President is doing exactly what he said he would do. Did you have your head under your arm? I have to agree that those short naps are fun. Afghanistan can be won if we decide to stay for a generation. That's 30 years give or take a few. Build the schools to educate the children, send the teachers who are being laid off with budget cuts here to work in Afghanistan (can be funded within the defense budget thus getting McCain's vote), fund USAID to completely revamp Afghan agriculture, have US Marines run the Police Force, and US soldiers build roads and maintain infrastructure. We have to raise a new generation of Afghans who see things differently. A fundamental part of that is being able to speak in English unlike the illegals here who still can't do that. That's what COIN is all about - ask McChrystal. Clearly from the poll results, Republicans are the only ones who have the generosity of spirit to stay there for the long haul. Especially the Tea Party. Democrats are more worried about Health Care in America, and jobs here. The way to achieve all of the aims above is to move everything into the defense budget where it then gets automatic approval, pretty much in the manner any aid to Israel is a no brainer for Congress. That reminds me of the second method of funding the Afghan effort. Remind Congress that it is in Israel's interest. Between moving the expenses into the defense budget and making sure Congress understands it is in Israel's interest, there will be no lack of funds or will. How would Americans like to be occupied? My son was posted to Afghanistan where he lived in a remote combat outpost and and took his squad out on patrol regularly. I am glad he got home safely and I hope he does not have to go for a third deployment. Unfortunately the risks he and hs fellow soldiers took seem to have been in vain. It is pretty clear to me from from closely reading every news report from the area, that our troops control their bases, most of the large cities, their combat outposts and the field of fire of their weapons. Our air supremacy is important, but does not allow us to control territory. The Taliban however are able to move about the countryside fairly freely. Despite our best efforts in much of the country the Taliban are able to assassinate or physically intimidate any government official they choose. They infiltrate into the cities and towns at will. They have been able to create a shadow government that is able to successfully contest with the central government and that would take over as soon as foreign troops leave. Their long term committment is unshaken. Meanwhile war weariness is setting in in Europe and to a lesser degree in the US. This is not a picture of a war we can sustain long enough to win. Worse Al Qaeda is simply moving their operations to other places, while we tie down most of our Army and spend more than we can afford. We need to re think why we are there since the trigger that took us into Afghanistan was that 9/11 was plotted and commanded from there. If all we want is not to be attacked from there again, perhaps we need to be willing to pull out, but leave behind the warning that if we are attacked again we will simply return for a scorched earth retaliation, nothing left to be rebuilt and no rebuilding. First, let's be clear here, Afghanistan NEVER attacked us on 9/11. The Taliban had nothing whatever to do with 9/11, nor did they ever attack us. What they did do was rent space to Osama Bin Laden and refuse to give him up, not that they could have if they wanted to. I don't care for what the Taliban represent but it is a simple fact that they never attacked the US nor a single US soldier or representative of the US until WE attacked THEM....Hope that clears it up for "dummypants". Meanwhile we are in Afghanistan for only two reasons: The oil pipeline that Exxon-Mobile has been after for decades and the Opium fields that have been supplying the CIA with drug money since WWII (the stories that the Taliban use the fields is entirely false. The Taliban were much despised by Afghani's for destroying the fields and cutting off the best supply of money the common farmers had than for cultivating). I am so sick of this idiot war and the idiot president that supports it. Most Americans are also sick of both. The real struggle is going to be over whether the left or the right wins. I'm afraid it will be the right, because the reality is that a third-party candidate is not going to win the next presidential election and the Democrats don't have the gonads to put up a real leftist for the office. GaryEMasters: How about the promises we made to our own people, whose tax dollars pay for this insane war but who do not have health insurance? How about them? What are they owed? Why is it so honorable to continue wars of aggression and not nearly as honorable to provide for one's own citizens? The photo-ops not as good? The word care doesn't sound nearly as catchy as the word honor? 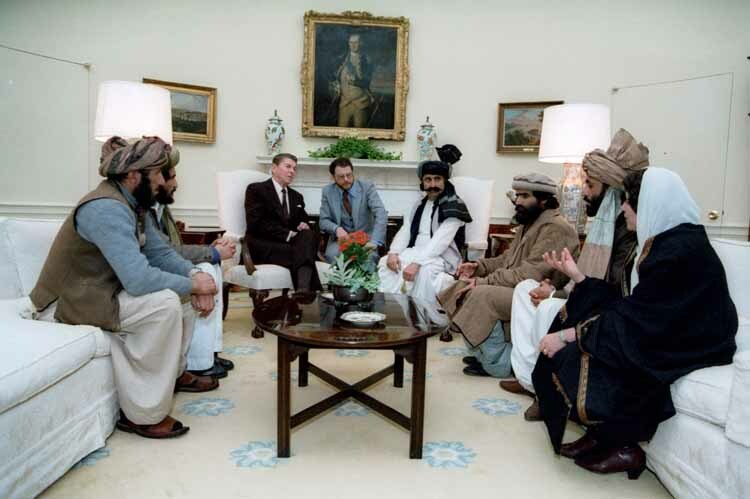 Did you ever see the picture of Reagan meeting the Taliban? Reagan called them "Freedom Fighters." Yes, bin Laden was an "honored guest" of the Taliban before and after 9/11. And Mullah Omar requested that the U.S. supply at least some minimal evidence that bin Laden was responsible for 9/11 before handing him over, which our government refused to do -- because we had no evidence. This remains the official position of the FBI -- on it's "most wanted" page for Osama bin Laden, the 9/11 attacks are not mentioned, and an FBI spokesman has responded, "because we have no evidence to implicate bin Laden for 9/11" (paraphrased). This simple statement of facts may be allowed here, buried in a marginal forum post, but the Post's notorious pro-war propagandists will never allow such truths to appear in their august paper.